Hi everyone! The first day for 2012 is coming to an end here in the Philippines and it surely was a great start for me. I had a filling celebration last night, welcoming the new year together with my family. Though there weren't much fireworks, as I heard it had been prohibited, the amount of food laid out on our table made up for it. Still, we did see a couple of fireworks display from neighboring areas :) Really pretty lights! This was taken New Years Eve in London 2011. Photo is not mine. 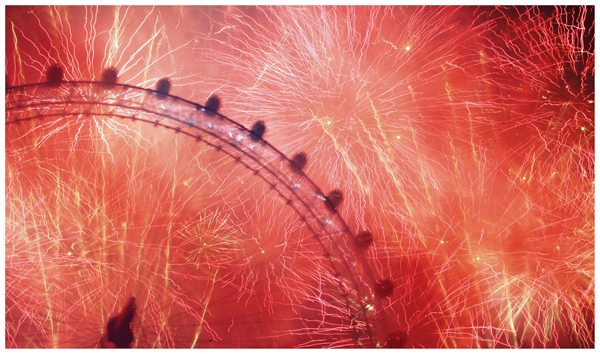 Click here to see a video of the New Years Eve in London 2012. Some of you might've seen my tweets about the negativity that has been attacking me since yesterday, but I won't delve into that anymore. I'm sure the person is just either misunderstood or something. Guess we're all bound to some sort of criticism eventually; after all, we have exposed ourselves to the Internet, which has a wide reach and as they say, "you can't please everyone" (especially with fashion/style, since we've all got our individual taste). Hope you all had a wonderful New Years celebration! As fellow CommArts and fashion aficionado, Ria Casco, said, "Cheers to our glittering futures!" Check back for more this January because I've got surprises lined up for you!! Happy 2012 Megann! :) Cheers to a year full of blessings and opportunities.